These are the items that were included on the "Late Breaking Website News" page in 2017. Items are listed with the most recent one first, and each article carries the posting date indicating when it was first uploaded. You should find this an interesting look at the important Shroud and Website events in 2017. Welcome to our Fall website update! This is another huge one and has literally taken until the very last minute to get it all completed! We start with an important comment from the STERA, Inc. Board of Directors and the introduction of a new page on the website dedicated to the recent International Shroud Conference in Pasco, Washington. Today's additions also include a Special Feature on The Shroud and the Eastern Orthodox Church, a new feature called News From Turin, the latest issue of the BSTS Newsletter, eight more issues of Rex Morgan's Shroud News, coverage of the recent 2017 Jalsa Salana Convention in England, news of a special Day of the Shroud in Krakow, Poland, the announcement of STERA, Inc.'s 2017 Fundraising Campaign, a preview of what is coming to Shroud.com in 2018, links to many new books, articles, papers and videos and much more. There should be enough here to keep you busy reading until Christmas! Let's begin! In 2015, after fulfilling all of STERA, Inc.'s formal requirements for accessing materials in our various collections, the Board of Directors voted to approve Giulio Fanti's request for access to three of the remaining tape samples from the Ray Rogers Collection. These were hand delivered to him in Turin in May 2015 by Barrie Schwortz. It should be noted that Barrie does not have a vote on the Board of Directors so did not participate in the decision to grant Giulio access to the samples. That decision was made solely by the Board of Directors. In the STERA, Inc. Materials Access Request form that Giulio completed, he stated that, "The material will be returned AS it will be furnished without impact of any kind. Possible minimal alteration will be agreed before any operation." This indisputably implies that the testing he would perform would be completely NON-DESTRUCTIVE and was one of the critical considerations STERA, Inc. used in their decision to grant his request and make the samples available to him. 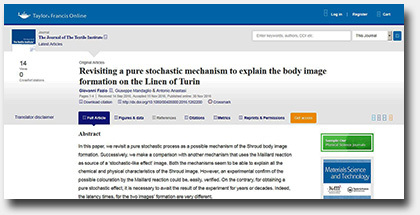 When Giulio submitted a copy to the board of the first paper he produced based at least in part on the samples we provided, titled, "Mechanical Characterization of Linen Fibers: The Turin Shroud Dating," the Board of Directors reviewed it and made a series of comments and recommendations to improve the paper and make it more accurate. [Editor's Note: A third paper by Giulio Fanti was published more recently, after the above statement had already been drafted by the Board. This new paper is also based (at least in part) on the samples STERA, Inc. provided, but, as of this writing, has not yet been evaluated by the Board]. With this update we add eight more issues to Rex Morgan's Shroud News archive, which will total 118 issues when complete. This update includes Issue #77, June 1993 through Issue #84, August 1994 with articles by such notable Shroud scholars as Ian Wilson, Alan D. Adler and Larry A. Schwalbe, Brother Bruno Bonnet-Eymard, Robert Halisey, Remi Van Haelst, Emanuela Marinelli and Orazio Petrosillo, Rev. Frederick Brinkmann, Prof. Alan Whanger and Mary Whanger, Emily A. Craig and Randall R. Bresee, Isabel Piczek, Ian Dickinson, Luigi Garlaschelli, Franco Ramaccini and Sergio Della Sala and many more. Our sincerest thanks as always to Stephen Jones for his extraordinary effort in scanning and optical character recognition of every page, Ian Wilson for providing the original issues and valuable input and of course, to Rex Morgan for his gracious permission to reprint them here on Shroud.com. We are pleased to report that the British Society for the Turin Shroud page of the website has been updated and the latest June 2017 Issue No. 85 of the BSTS Newsletter is now online. 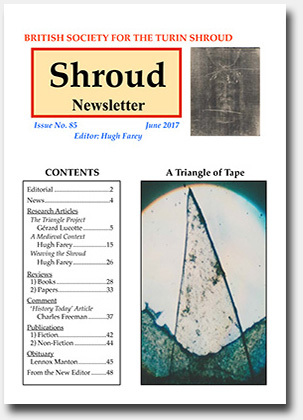 This issue includes several in-depth research articles starting with The Triangle Project by Prof. Gérard Lucotte, Towards a Medieval Context for the Turin Shroud by Hugh Farey, the newsletter's current Editor and a second article from Hugh documenting the hand made herringbone woven cloth he commissioned titled, Weaving the Shroud, A Reproduction by Ruth Gilbert. The issue also includes a comment by noted Shroud skeptic Charles Freeman titled, "The Origins of the Shroud of Turin - My History Today Article, Thirty Months On." It also includes reviews of a number of books and papers, an Obituary for Lennox Manton by Ian Wilson and much more. This issue also marks the last issue from current Editor Hugh Farey, who is retiring from the position he has held since December 2013 and handing it over to long time BSTS member, David Rolfe. David is best known in Shroud circles for his films on the Shroud which include The Silent Witness, the BAFTA-winning production from 1978 which introduced so many to the subject for the first time. 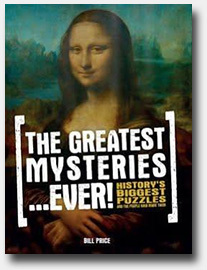 His second film for the BBC in 2009 - Material Evidence - included Prof. Christopher Ramsey, Head of Oxford's Radio Carbon Center, who conceded, memorably, that in the light of the new evidence and the lack of any substantive explanation for the Shroud's image, the C14 should be looked at again. David's third film, Shroud - Passio Christi - Passio Hominis, has been the official film for the last two public expositions in Turin and the most recent - A Grave Injustice - is available on YouTube. David shared a platform with me recently, along with Bruno Barberis from Turin and former BSTS editor, Mark Guscin, at the Shroud Exhibit at the Jalsa Salana event hosted in the UK by the Ahmadiyya Muslim Community's publication, Review of Religions. (See more on this event below). David's intention, subject to maintaining subscription levels, is to continue with the printed edition of the Newsletter, which will remain available to its subscribers who will also have access to a new BSTS online forum. This will feature comments from subscribers who may wish to take up any particular issue with the Newsletters's authors, contributors and reviewers. Each new edition will continue to be archived here on Shroud.com 12 months after publication so that the whole collection of articles going back nearly 50 years can be readily searched online. I know the first edition will include, among other things, the first published fruits of Ian Wilson's extended research into the de Charney family and the first expositions in Lirey. I understand it will lead to some revisions to some long established assumptions. There will also be a review by Hugh Farey of the new comprehensive publication from John Jackson, a new article from Paolo di Lazzaro and also an article from Arif Khan, who has curated the Ahmadiyya Community's Shroud exhibition and conference in the UK for the last three years and brings an Islamic perspective to the subject. The BSTS has a proud history and I hope as many of you as possible will continue to support it. You can take out or renew your subscription at this link: www.bstsnewsletter.com. An added bonus to the conference were two film crews on site to interview various experts for two new documentaries. One will air here in the US and the other will air in China! One last shout out and thanks…to Treau, a young lady from New York who volunteered to be our time keeper for each speaker. She was indispensable for keeping us all on track. Once again, kudos to Bob Rucker and his team for putting together a terrific conference and sharing it with the world via streaming video. It was my honor to emcee the event. I was once again privileged to attend and speak at the 51st Annual Jalsa Salana Convention near Guildford in Hampshire, England on July 28-30, 2017, marking my third year at the event. As I have reported previously, the convention is held annually by the Ahmadiyya Muslim Community in England and this year's attendance reached around 40,000 people for the three day meeting. For the third successive year, the Review of Religions magazine, a 115 year old Ahmadiyya publication, sponsored a large marquee (tent) that included Pam Moon's beautiful Shroud Exhibit along with a superb exhibit of ancient Korans, collected and curated by my dear friend and world renowned Islamic calligrapher, Razwan Baig. Most exciting this year was the attendance and presentations made by three highly regarded European Shroud scholars including Bruno Barberis, Past-President of the International Center of Sindonology in Turin, Italy, Mark Guscin, noted author, linguist and expert on the Sudarium of Oviedo from Spain and David Rolfe, award winning filmmaker, Shroud scholar and the new Editor of the BSTS Newsletter from England. As an added bonus, we were all pleasantly surprised by the attendance of our good friend Jostein Andreassen from Norway, who holds the distinction of having written the first book about the Shroud of Turin in the Norwegian language. Although he and I have corresponded for years, it was great to finally meet him in person. In fact, you can view Jostein's report on the Jalsa in his website article (in Norwegian) titled, Et opplevd eventyr (An experienced adventure). You can also read my two previous articles on the Jalsa Salana at these links: Personal Report on the 2015 Jalsa Salana Convention - and - Personal Report on the 2016 50th Annual Jalsa Salana Convention. They include details and many photographs of the events. The Review of Religions team have welcomed Pam Moon and me as official members of their Shroud Exhibit Planning Committee and the exhibit has grown and become more refined over the past two years. This year, in an effort to improve the overall exhibit, the normally translucent tent material was covered and blacked out and each individual part of the exhibit was lit separately using museum style lighting. The effect was more powerful and dramatic and made one feel like you were actually standing in a museum. In past years, speakers would make their presentations in the exhibit area itself, but this year the Review team obtained a separate marquee, solely for the presentations of the speakers. This accommodated a larger seated audience in a more comfortable and less distracting setting and was a major improvement over previous years. Of course, the most important part of the event for me this year was the attendance of three prominent European Shroud scholars... (Read more and see many photographs: A Personal Report on the 2017 Annual Jalsa Salana Convention). We are very happy to report on the latest activities from the Centro Internazionale di Sindonologia (CIS) or International Center of Sindonology in Turin, and there have been many! We will summarize them here and provide you with links to some of the most important new information. Our special thanks to Enrico Simonato, Secretary of the CIS, and Paola Cappa, CIS External Relations, for sending us the information. 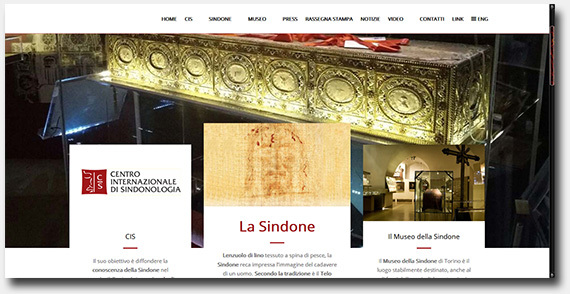 At the top of the news is the Sindone.it Website, which has just undergone a serious redesign and update. Only the Italian language pages have been updated as of this writing, but an English language version of the newly redesigned site is currently being created and the English language version of the original design is still readily available by clicking on the "English" icon on the top right corner of the page. When you first arrive on the site, you need to click on the "Home" button at top left to see the above view of the page. The site now has a fresh new design and improved navigation which should make it easier for visitors to find what they are looking for. Of course, if you prefer you can also use Google (or some other online translation service) to translate the newly revised Italian language pages directly. For a more detailed History of the CIS than is provided in the brief overview above, this link is to a more in-depth history of the organization. Among the many recent activities to report, the CIS recently elected their new Board of Directors. Here is an article (in both English and Italian) that lists not only the new Board members, but also the recently created Regional Directors and the updated members of the Scientific Committee: New ICS Organization. The CIS is also charged with the responsibility of maintaining the Sindone Museo or Shroud Museum in Turin. It houses the second largest collection of Shroud related materials in the world (second only to the Savoy Collection). Enrico was kind enough to send us a comprehensive history and other important details about the museum so we have compiled it all into a single document titled Museum of the Shroud and are making it available to you today. "It was great to meet you and attend your presentations at Immaculate Conception Academy in Cincinnati back in March. My friend Brian Farison also benefited greatly from your talks and the opportunity to speak with you after. I'd like to share with you some links to presentations and news stories, as well as PDFs of the most significant ones, which might be of interest to some of your readers, coming as they do from the little reported Orthodox Christian perspective. These might be suitable for your Religion & Philosophy Page at shroud.com, and I have tried to provide some synopsis and context for each." Ralph provided us with so much material and relevant links that there is far more than I can include on this page. Consequently, to make it easier to find and review all the related articles, I have also compiled everything into a single comprehensive document titled, "Shroud Presentations and News within the Eastern Orthodox Church," which includes all the Eastern Orthodox related articles, links and notes and have permanently archived them as Ralph suggested on the Religion and Philosophy and Website Library pages of the site. I am including a number of these links below to get you started. One of the only serious studies of the Shroud by an Orthodox writer: The Shroud of Turin: A Mystery Across the Ages (link to online version) by Fr. Alexey Young. (Also available in a stand alone PDF version). Somewhat dated in terms of the science, but some deep, serious reflections on the meaning of the Shroud, including why it might have been providentially preserved to our day, when science itself has to struggle with the mystery of how the Image was created. This article also draws out references to the Shroud embedded in Orthodox hymnography and worship, especially in the Holy Week services. A talk by Deacon Stephen Muse, 'Holy Image, Holy Blood' (link to online video and transcript). (Also available in a stand alone PDF version) - This talk has a great deal to recommend it for it insights into the Eastern Orthodox Church. The video is unfortunately just done from a stationary video camera, so it is hard to make out most of the images he talks about, but one could find them through online searching. Ralph included some specific notes on this presentation which are included in the comprehensive version mentioned above. 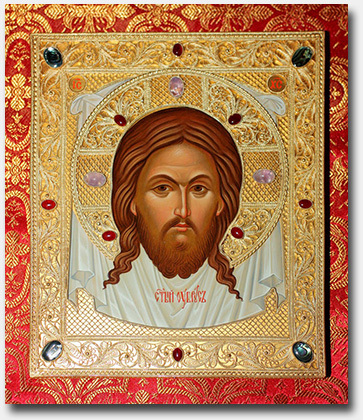 An excellent gathering of articles, icons and Orthodox hymns, The Holy Mandylion (Napkin) of Christ (Not-made-by-hands), from the Orthodox blog, 'Full of Grace and Truth'. (Also available in a stand-alone PDF version). This combines hymnography and history of the Holy Mandylion - the 'Image Not Made by Human Hands' - which is, of course, very likely the Shroud in its Tetradiplon folded status as it was venerated in the Christian Church from the sixth century through the sack of Constantinople in 1204. There is much Orthodox material in this profusely illustrated collection, plus many embedded links. Our good friend "O.K." in Poland has advised us that the John Paul II Centre in Kraków (led by Father Mariusz Kielbasa), which has a permanent Othonia-licensed exhibition about the Shroud (http://calun.info), are planning a special event this autumn: Day of the Shroud of Turin in Kraków (Dzien Calunu Turynskiego w Krakowie). The event will take place on Saturday, 21st October 2017, in the Sanctuary of St. John Paul II in Kraków. The event consists of three parts. The first part is devoted to the research of the Shroud. It will start with the inauguration of the Polish Syndonology Centre, with the goal of bringing together Polish Shroud experts and to popularize the knowledge of this topic. Next on the schedule are lectures about the Shroud, including one by Dr. Gian Maria Zaccone, the President of Turin's Centro Internazionale di Sindonologia. The culmination of this part is a panel discussion entitled The Shroud: a challenge to our intelligence and a mirror of the Gospel, bringing together Polish and Italian experts, including the authors of the book, Autopsia dell'Uomo della Sindone. 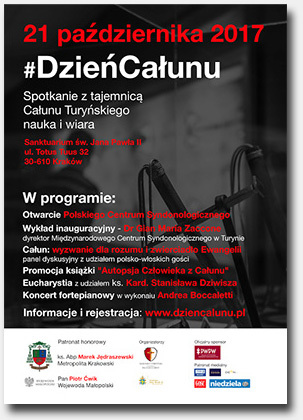 The book itself will soon be published in Polish under the title Autopsja Czlowieka z Calunu. The third and final part will be an accompanying piano concert by famous Italian pianist Andrea Boccaletti. If you wish to attend, admission is free but registration is required. You can do so on the Official event website, Dzien Calunu (in Polish) or on site on the day of the event. "O.K." was also kind enough to send us an article with more details and the event schedule and it is available at these links in both English and Jezyku polskim. Thank you for letting us know "O.K." 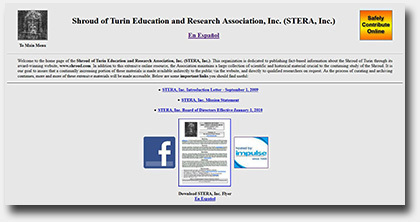 I love the work I do as editor of this website and as President of STERA, Inc., but one of the most difficult (and uncomfortable) responsibilities I have is raising funds each year in the form of tax deductible contributions to support the website and our other long term projects. Frankly, with the large number of visitors we have each year, we could generate substantial revenue by allowing advertising on the site, but we have never allowed ads in our 22 year history and have no intention of allowing them in the future! That means that we need your support to help make up the difference. As President of STERA, Inc., I am obligated to solicit contributions from our viewers and subscribers, just like every other non-profit in the world. Of course, unlike most non-profits, we only have one annual fundraising effort near the end of each year. We prefer not to bombard you with continuous requests for contributions during the course of the year (which I am sure you appreciate). But now, that time has come again and this year we are offering some new ways to support STERA, Inc.
Our newest means of supporting STERA, Inc. is via "Giving Assistant," which allows you to shop at more than 3000 of your favorite brand-name stores and receive cash back for all your purchases. You can then specify what percentage of your cash back earnings you would like to have automatically donated directly to STERA, Inc. We already have several supporters using this method and we encourage our viewers who shop online to help support us this way. 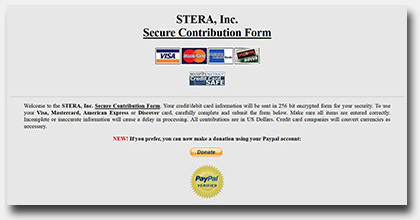 You can save money and help STERA, Inc. at the same time! Last year we announced our participation in a non-profit program from Amazon called "Amazon Smile," which allows you to shop as you normally do and Amazon will donate 0.5% of the purchase price directly to STERA, Inc. Amazon charges no fees for this service and you can even adjust your settings to automatically enter Amazon Smile every time you log on to the Amazon website. It provides an easy way to support our work and this website without spending anything extra. As soon as we instituted it last year, it quickly became a great success. We thank all of you who logged in and began supporting us this way. We truly appreciate it! We have also joined with eBay For Charity to provide an additional way to support Shroud.com and STERA, Inc. You can use it whether buying or selling on eBay and a percentage that you designate is donated to STERA, Inc.
You can also support STERA, Inc. and Shroud.com by purchasing items directly from our Website Store page. With the holidays fast approaching, you might want to look at some of the items we make available, including a miniature Shroud replica on cotton canvas, a set of high quality lithographic prints, several different Shroud transparencies in backlit PhotoGlow frames and a number of DVD's. Any of them would make great gifts for your favorite Shroudie! Order by December 15, 2017 for Christmas delivery. Of course, we have also made it very easy to safely make a tax deductible contribution online using PayPal or your credit or debit card via our Secure Contribution Form (or by clicking on the graphic at left or at the top of this article). The form also includes details on how you can contribute by Mail or by telephone. Naturally, we hope many of you will contribute generously since we must rely in part on our viewers for financial support. We understand that you are constantly being asked to donate to many worthwhile organizations and hope you will consider STERA, Inc. and Shroud.com worthy of your support. As further incentive and to express our gratitude for your contributions, we are offering contributors a number of excellent gifts for their support. We thank you in advance for your consideration and generosity. Our dear friend, Dr. Julius Lopez, a member of the Centro Mexicano de Sindonologia (CMS) in Mexico City and a long time contributor to Shroud.com (he and his son Julio are responsible for many of the Spanish language pages and translations on this website), has recently begun digitizing the CMS Boletin Sindone, the official Spanish language publication of the CMS that first appeared in 1983, and we have agreed to archive the journal here on Shroud.com starting sometime next year, as soon as the Rex Morgan Shroud News archive is completed. This will mark the first time that we archive a non-English language publication on this site and we are very pleased to finally accommodate our many Spanish speaking viewers around the world with a Shroud journal in their own native language. The journal will be presented in text readable pdf format so that non-Spanish speaking viewers can use online translation services to convert the files to their own language. (That's exactly what our Spanish speaking viewers have had to do with our English language pages for years)! We are grateful to Julius and Julio for doing the scanning of all the issues and look forward to working with them and the CMS to create a lasting online archive of their work. The good news doesn't end there. Our good friend and noted Shroud scholar, Paul Maloney, is making available for the archives the only three issues of the ASSIST Newsletter that were ever published. It was the short-lived publication of the Association of Scientists and Scholars International for the Shroud of Turin, of which Paul was the General Projects Director and a founding member. The publication was first produced after ASSIST acquired the Max Frei sticky tape collection in 1988. The third and final issue was published in June 1990. We are still working with Paul to finalize the files and hope to include them sometime in 2018. Finally, next year marks the 40th Anniversary of the ground breaking scientific examination of the Shroud in October 1978 by the Shroud of Turin Research Project (STURP). As one of the few remaining original team members that is still living and involved with the Shroud and as Editor of Shroud.com, I feel obligated to do something special to commemorate this milestone in Shroud history. To that end, I am considering a number of different options, but will definitely include a special update to the website. However, since we still have some time to decide, if any of you have some ideas and would like to suggest them, I would consider any serious suggestions. Just send us an e-mail and share your thoughts. 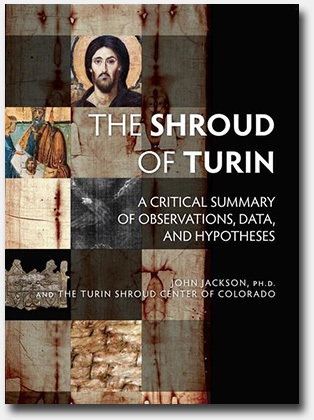 Observations, Data and Hypotheses by John Jackson, Ph.D.
Several new Shroud related books have been published in recent months. We are listing them here but have also permanently archived them all on the Shroud of Turin Booklist page (alphabetically by author). To make it easy to find the new additions, we have annotated each new listing with "(Added 10 October 2017)" so simply search for that phrase on the Booklist page. "The Shroud of Turin is the single most studied object in the history of the world. Since 1978, John Jackson, PH.D. in physics, has continued to conduct research with his team in Colorado, investing tens of thousands of hours in ongoing research. 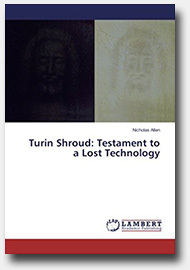 "The purpose of this publication is to provide an up-to-date overall summary of the corpus of Shroud evidence. Included here is key evidence that traces its source back to the Shroud of Turin Research Project, as well as data from the broad spectrum of other scientific, historical and artistic Shroud research that has been conducted around the world. "One thing that is certain: The Shroud is an artifact that exists. It is of interest because traditionally it has been venerated as the burial cloth of Jesus of Nazareth. This is a remarkable claim. Can it be true? Take a journey through an examination of evidence and come to your own informed judgement regarding the question of the "authenticity" of the Shroud. This timely book will enable you to begin that journey." "The heated debate still rages as to how the seemingly miraculous, life-size, two-fold image of the crucified Christ appeared on the Shroud of Turin. 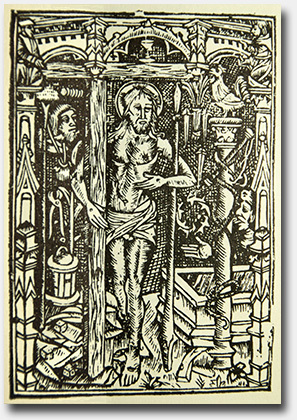 Was it the actual burial cloth which wrapped Christ's body 2000 years ago or was it simply a clever medieval forgery? 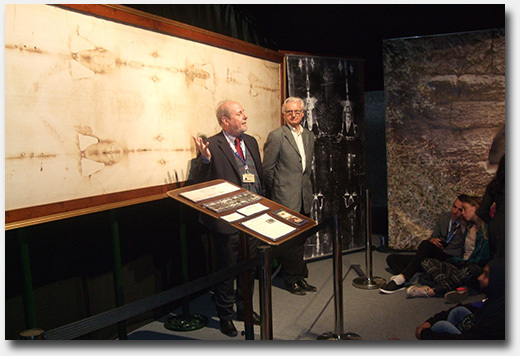 Prof Nicholas Allen, the originator of the photographic hypothesis for image formation on the Shroud of Turin, has been researching this phenomenon since 1988. He shares the secrets of how medieval alchemists managed to make this incredible image over 600 years ago and successfully addresses, inter alia, the following issues: The historical evidence for persons knowing about the camera obscura, lenses and light-sensitive chemicals before c. 1357. He also shares with you his exhaustive, practical experimentation in order to ascertain the possibility of producing an image which duplicates the characteristics of the Shroud of Turin employing only those substances and equipment that existed in a medieval society." "Were you as a reader often disappointed by the content of a book? Then read a book that has not been written by human hands. If you think that such a book does not exist in this world, you have not yet found the Holy Grail. It contains demonstrable not only the blood of the Savior, but also a picture-puzzle, from which God speaks to us and which is so far unknown in the public..."
"There is still plenty of room for new research, not least in discovering, if it is not the result of a miracle, exactly how the shroud was fabricated, a question that has so for baffled all those who have studied it. Ian Wilson, in his book, The Shroud, comes to the eminently sensible conclusion that the best course of action for anyone interested is to consider all the available evidence and then make up their own minds about whether they think it is real or fake." "By writing this book, I am setting the record straight on a relic that has been maligned, misunderstood and misconstrued on several levels. This work not only alleviates concerns that a Christian may have about the Shroud, it also makes known the amazing connections between this cloth, touched by our Lord and Saviour, and the truth revealed in Scripture.When I first approached the Shroud in this fashion, I was unexpectedly surprised at the wealth of information it provided. Once you pass the fork in the road and consider that the Holy Shroud is authentic, its impact upon Christian theology is akin to finding a whole new Gospel. It becomes far more than a simple object for veneration. It opens up a new vista to view the human story in relation to our place in eternity." URDU - The Holy Shroud of Turin: a genuine artifact of the resurrection of Jesus Christ by Dr. R. Gary Chiang, Ph.D. Now available in the Urdu language as a PDF download. 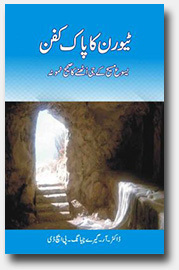 Translation into Urdu was done by Ashraf Ghani of Light of the World Ministries International, Pakistan (ssmpk.webs.com). This Ministry works with needy and deserving children, with the mission to uplift lives of the neglected children in the society and teach them the Word of God so that they may grow in their spiritual life. Funds obtained by the sale of the Urdu pdf will go towards Ashraf's ministry. Once again, a large number of papers have been published in recent months that are relevant to Shroud research and we are including many of them here. The first two are by blood and DNA expert Kelly Kearse and are published here on Shroud.com for the first time. Kelly's papers were evaluated and accepted for publication by the STERA, Inc. Editorial Review Committee and mark the sixth and seventh of his original papers that we have published. For the record, I should note that the review process used by the STERA, Inc. Editorial Review Committee does NOT constitute peer review. I purposely created the committee so that I would not be the only person deciding what materials we publish on this website and the committee simply helps me to evaluate those papers that are submitted. However, that is a far cry from the rigorous academic peer review offered by refereed journals that focus on specific disciplines of science and where the reviewers are all generally experts in the same field. Also included today, as always, are links to many other papers and articles that were published more recently. All have also been permanently archived on the Scientific Papers & Articles page (alphabetically by title) and the Website Library page (alphabetically by author). "Initial characterization of the bloodstains on the Shroud of Turin indicates that blood components are present, findings that are consistent with the presence of real blood on the cloth. The bloodstains on the Shroud have been primarily evaluated from a chemical perspective, though much less so from the context of immunology, particularly in elucidating the species of origin. For example, while it is commonly reported that the blood is human, the immunological data for the type of blood present on the Shroud remains incomplete. To date, this issue is still scientifically unresolved. Furthermore, it is often misunderstood that previous studies have ruled out the possibility that blood from other animal types (cow, horse, chicken, etc.) might be present on the Shroud, when, in fact, this subject has never been addressed by experimentation. Indeed, with one exception (rabbit), which occurred serendipitously, no data exists regarding this issue. Here, the current knowledge of the types of blood that might exist on the Shroud of Turin is discussed, emphasizing results for which empirical data actually exists, the strength of such data, and estimations that remain to be determined." "Hemoglobin (Hb) is the major protein present in red blood cells whose function is to transport oxygen throughout the body. The oxygenated form of hemoglobin is responsible for the typical red color of fresh blood that is normally observed. Carbon monoxide (CO) binds to hemoglobin with an affinity 250-300 times greater than that of oxygen, making it a highly competitive, toxic substance which can be lethal at even relatively limited levels of exposure. 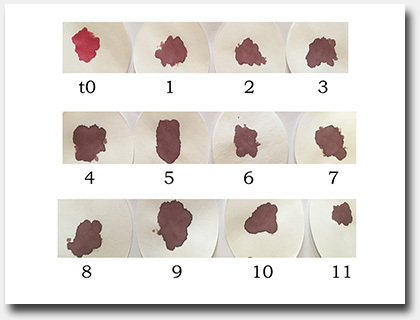 Blood drawn from patients experiencing CO poisoning exhibits a "cherry red" appearance, which is often useful in the initial diagnosis. CO levels from such patients have been reported to persist in refrigerated sealed liquid blood samples stored in the presence of preservatives for at least three years; however, no data exists regarding the persistence of CO in aged, dried bloodstains. It has been noted that the bloodstains on the Shroud of Turin appear too red in color for blood that is reportedly some 600-2000 years old. Various explanations have been put forth for the blood color on the Shroud, including the suggestion that CO bound to hemoglobin via endogenous or exogenous mechanisms is responsible. In this report, the effect of CO exposure on bloodstain color is evaluated and its relevance to the appearance of the Shroud of Turin bloodstains is discussed." "The Raman spectrum of a microsubstance, smeared on a fiber coming from the Shroud of Turin, was compared with numerous spectra published for old or modern pigment dyes, whole bloods, dried bloods, red blood cells, albumin, very ancient blood stains, and various “degradation” products of heme. Within the wavenumber measure accuracy, it is shown that all Raman lines detected above background could correspond to vibration frequencies found in biliverdin-derived compounds except a weak line that we tentatively attributed to amide I. Biliverdin is known as an oxidative ring cleavage product of the heme of blood. Energy dispersive spectroscopy (EDS) analysis of the sample confirms an elemental composition fully compatible with this hypothesis. Therefore, it is very likely that this microsubstance contains products of heme including heme/biliverdin-derived compounds and protein traces (amide I). Nevertheless, other measures will be necessary to confirm it. This method of identification, adding EDS to Raman spectrometry can be applied to nondestructive testing (NDT) of many other microsamples." EWTN Live - The Shroud of Turin – Hosted by Fr. Mitch Pacwa - 56:31 - October 4, 2017 - The Most Rev. 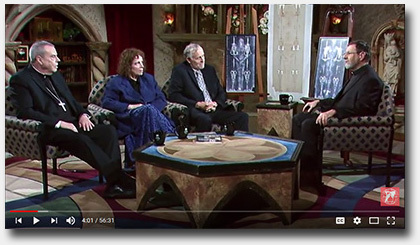 Michael Sheridan, Dr. John Jackson, Aries Koumis and Rebecca Jackson discuss the American Confraternity of the Holy Shroud's mission to spread the message of the Shroud. Videos of every Presentation made at the Pasco, Washington Conference - July 19-22, 2017 - Via Russ Breault's Shroud University Pasco 2017 page. As always, many articles have appeared on the internet about the Shroud since our Summer Update in June. Once again, we have included several of them here and hope you find them interesting. Shroud of Turin copy on display at Brewood church - PICTURES and VIDEO - Express & Star - Clare Butler - September 10, 2017. Great story with photos and video of Pam Moon and her husband, Rev. 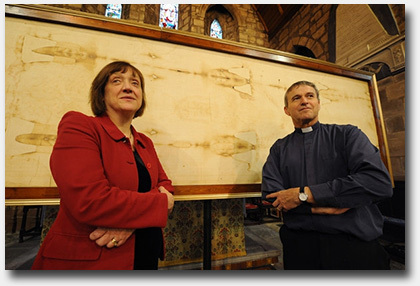 Phil Moon, at her Shroud Exhibition on display at St. Mary and St. Chad Church in Brewood, Stafford, England. Linceul de Turin : pourquoi la datation au carbone 14 serait invalide (Shroud of Turin: Why Carbon Dating would be invalid) - Aleteia - Ronald Barakat - June 10, 2017. This is a French language interview with Fares Melki, Lebanese Sindonologist since 1978, author of several books in Arabic on the Shroud of Turin and host of the unique, Arabic language scientific site, Kafan al Massih, devoted to the Holy Shroud. Do You Believe in Miracles? - Humunculus - Phillip Ball - March 27, 2017 - Interesting blog post regarding Tristan Casabianca's recent article on the Shroud. Includes public comments and a rebuttal from Tristan. Typically, when someone of importance or notoriety in the Shroud world passes away, we publish an in-depth memorial to remember their contributions to Sindonology, whether they were positive or negative. 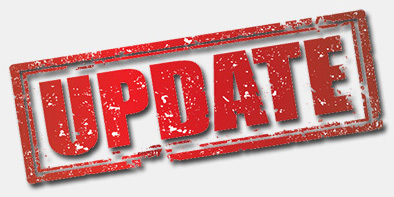 Since our Summer Update, I received word of the passing of several important people that fall into that category. Sadly, so much time has passed since some of their deaths that a full memorial would be somewhat awkward and untimely, so we are simply listing them here to remember them and their contributions, perhaps not in depth, but at least in passing. We extend our deepest sympathies to the familes and friends of those who passed. "I have considered David Balsiger my friend ever since 1993 when we first met for the making of his documentary, "Mysteries of the Ancient World", which aired on CBS. He also produced "The Fabric of Time" and "The Case for Christ's Resurrection," both of which were very positive in their treatment of the Shroud. I have met with David many times over the years and more by phone. He was a sincere Christian and I know many lives have been changed because of his tireless work. I will miss him but I am greatly comforted knowing he is enjoying total peace, love and joy in the Kingdom. 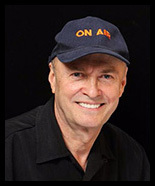 Russ"
"David was a lifelong investigative journalist, activist, photographer, speaker, best-selling author, and award-winning film producer and director. His multimillion copy books (co-authored with the late Charles E. Sellier) In Search of Noah's Ark and The Lincoln Conspiracy (on the New York Times Best Sellers List for 22 weeks, reaching the #2 position) were both made into major movies of the same titles. "For 12 years David was the Vice-President of Marketing and Senior Producer at Grizzly Adams Productions, producers of 500 family friendly movies, documentaries, TV specials, and series including "Ancient Secrets of the Bible" and "Encounters with the Unexplained." David Sox was a controversial figure in the Shroud world. He entered as a believer in the Shroud's authenticity but changed his opinion after having a hand in the controversial radiocarbon dating in 1988. He subsequently became a vocal critic and claimed the Shroud was a forgery. His official obituary is available online at this link: David Sox. Below is an excerpt. You can read a much more extensive obituary along with an in-depth summary of his role in the 1988 radiocarbon dating on Stephen Jones' Blog. "David, as he was known his entire life, died at home in Palm Springs, California on August 28, 2016, after a brief struggle with colon cancer... He is the author of numerous articles and 11 published books on varied subjects from the Shroud of Turin, art collectors and forgers and in later years subjects dealing with well know Quakers. Various titles include 'The Shroud Unmasked', 'Relics and Shrines", 'Bachelors of Art' and 'Unmasking the Forger'. His later subjects included biographies on John Woolman and Pere David, early naturalists and environmentalists." We just learned that Prof. Willy Wölfli, director of the Zurich Polytechnic at the time of the 1988 Shroud of Turin radiocarbon dating, died on 1 March 2014. The Zurich laboratory was one of the three laboratories that performed the dating. Unfortunately, we were unable to find his official obituary or any details of his passing. Our next major update will go online January 21, 2018 and will mark our 22nd anniversary online! Frankly, it is already shaping up to be another large one and will include more of the Pasco Conference papers and presentations. It will also include more issues of Rex Morgan's Shroud News, the latest papers, books, articles and videos and of course, any breaking Shroud news. To be sure you don't miss any important Shroud information as it occurs, check our STERA, Inc. Facebook page from time to time, since we now try and update it weekly to keep you informed between our regular website updates. You do not need to have a Facebook account to view our page. You can also join our Website Mailing List and receive an e-mail whenever the site is updated or any important Shroud news breaks. We hope you find this update interesting and useful and look forward to seeing you in a few months. And as always, thank you for being there! The last few months have been exceptionally busy ones. I was traveling and lecturing throughout much of the Lenten season and had the misfortune to pick up a bug along the way, which put me in bed for two weeks and forced me, for the first time ever, to cancel one of my lectures (in Ottawa, Canada). Fortunately, my good friend John Iannone graciously took my place at the last minute. Of course, the Lenten season is also our busiest time of year and consequently, the backlog of materials that have accumulated since our last update in January is immense! Today's additions include the Program for the upcoming International Conference on the Shroud in Washington State, ten more issues of Rex Morgan's Shroud News, a Memorial for three departed Shroud scholars, a Special International Feature on the Polish Theological Society and their Syndonology Section, news about the upcoming 2017 Jalsa Salana Convention in England and a new addition to our Speakers Directory, along with links to many new books, articles, papers, videos and much more. There should be enough here to keep you busy reading until our Fall update! Shall we begin? It is with deep sadness that I must report the passing of our dear friend and colleague, Gina Phillips Moran Glick, M.D. on February 23, 2017 in Coppell, Texas, after a long illness. For those of you new to Shroud research, you might not know that Gina was an anesthesiologist with a strong interest in the medical and forensic science aspects of the Shroud and is the sister of noted Shroud scholar and optical engineer, Kevin Moran. 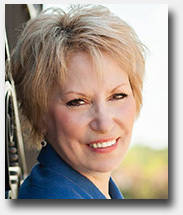 Over the years Gina attended many Shroud conferences and was an active participant in the online Shroud Science Group. A memorial service was held at Christus St Joseph Village on April 7, 2017 and the Catholic Rite of Christian Burial was held the next day at Christus St. Joseph Village chapel. Interment was at Saints Peter Paul Catholic cemetery in Cumberland, Maryland. Here is a link to an article in the Cumberland Times News titled "Dr. Gina's Story" kindly provided by her brother, Kevin. Our sincerest condolences to Gina's family, friends and colleagues for their loss. It is again with deep sadness that I must report the recent passing of noted British Shroud scholar Lennox Manton on February 14, 2017. Lennox was a long time member of the British Society for the Turin Shroud and contributed many articles and monographs to the publication. Since I never knew Lennox personally, I am grateful to Emanuela Marinelli for providing us with a link to her Collegamento pro Sindone website News Page and Ian Wilson's fitting memorial titled, A tribute in honour of his longstanding services to the British Society for the Turin Shroud. We are reprinting it here as well. Our sincerest condolences to Lennox's family, friends and colleagues for their loss. "Amongst Lennox's many interests was the Turin Shroud, the so controversial cloth that allegedly wrapped Jesus' dead body after his crucifixion. Lennox joined the British Society for the Turin Shroud not long after its foundation in the late 1970s, at a time when media interest in the topic was particularly intense. Thereafter he was a regular attendee whenever the Society hosted lectures in London, in later years making special train journeys from Stirling for this purpose. Lennox also pursued his own original researches into the subject, alongside furthering one of his other research passions, the travels of St. Paul. Both of these lines of research took him to Turkey, where in the case of the Shroud he pioneered exploration of the rock-cut churches of Cappadocia, very ably photographing - amongst much else - their often badly damaged but Shroud-inspired depictions of the Christ Pantocrator, also hitherto little-known depictions of the Image of Edessa, the Eastern Orthodox Church's fabled 'lost' cloth imprinted with Christ's image, controversially identified with the Shroud. "In April 1994 Lennox gave a very memorable illustrated lecture on these researches to a well-attended meeting of the British Society for the Turin Shroud held at the New Cavendish Club in London. Later the same year his monograph of the same findings was published from Australia by Australian promoter of Shroud studies Rex Morgan, MBE (Member of the Order of the British Empire). Although my wife Judith and I emigrated to Australia the following year (quite independently of the Rex Morgan connection! ), Lennox regularly kept in touch with us throughout the two decades since. Only in the most recent years did what had been emails from him lapse back to conventional postal communications, at which point Lennox graphically described his and Ruth's herculean efforts trying to stay as independent as possible despite their nonagenarian vintage! "Lennox was blessed with a diversity and universality of interests, amongst these the medical science that was necessary for his dental profession and the art and history knowledge that was necessary for his Capadocian rock paintings studies, a universality that is sadly becoming all too rare in today's so specialist and so communications-obsessed twenty-first century world. 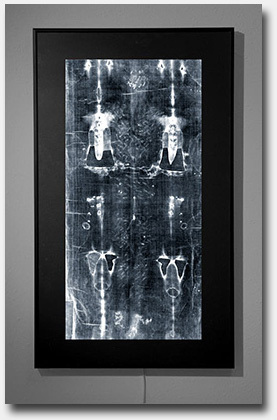 When carbon dating tests carried out on the Turin Shroud in 1988 were widely broadcast as 'proving' the cloth to be a medieval fake Lennox, unlike so many others, most admirably held steadfast to his own longstanding 'authentic' opinion, for me personally a most valued source of support and reassurance at a very difficult time. Throughout the decades that I have known Lennox I have felt privileged by his friendship. He invariably presented as a paragon of integrity, wide knowledge, quiet faith, gentle humour and sound sense. He richly deserved the long and full life that he enjoyed. Even though I mourn the death of yet another old friend, I can only feel grateful to have known him, and to have learned that he died with dignity and peace on the 14th of February 2017. (Ian Wilson – February 24, 2017)"
We must also sadly report that Mario Moroni, highly respected Italian Shroud scholar and author passed away on April 2, 2017 at the age of 84. Again, our thanks to Emanuela Marinelli and her Collegamento pro Sindone website for letting us know and publishing the below obituary. Again, our sincerest condolences to Mario's family, friends and colleagues. "A great Shroud scholar has gone back to the Father's House. Mario Moroni passed away yesterday at 84 years of age and he was one of the great Shroud scholars. He was a scholar, but also a great person. The books he used to prepare the "lessons" he held in front of the students of the schools in Brianza have remained on his desk. He lived in Robbiate, where also were the headquarters of the group of scholars who, together with him, had deepened the studies on the Sacred Cloth.Synopsized in the 22 panels of the traveling exhibit with which he illustrated the detailed studies, such as the simulation of the 1532 Chambéry fire, and the results obtained. His interest towards the Shroud dated back to the 1978 Exhibition. Besides the specialized library, with 500 books, he had hundreds of publications and dozens of folders with the results of the experiments carried out in 35 years. He also wrote books. The last one, "Lungo le strade della Sindone", was written in collaboration with Francesco Barbesino. (www.merateonline.it/ - April 3, 2017)"
With this update we add ten more issues to Rex Morgan's Shroud News archive, which will total 118 issues when complete. This update includes Issue #67, October 1991 through Issue #76, April 1993 with articles by such notable Shroud scholars as Isabel Piczek, Father Peter Rinaldi, Revd. Albert (Kim) R. Dreisbach, Orazio Petrosillo and Emanuela Marinelli, Brother Bruno Bonnet-Eymard, Robert Halisey, Remi Van Haelst, Dr. Michael Clift, William Griffin, Prof. Alan Whanger and Mary Whanger, Revd. Charles Foley, Mary Warner, Ian Dickinson, Bro. Michael Buttigieg, FSC, and many more. Also included are two issues memorializing the passing of Group Captain Lord Cheshire and Father Peter Rinaldi. Our sincerest thanks as always to Stephen Jones for his extraordinary effort in scanning and optical character recognition of every page, Ian Wilson for providing the original issues and valuable input and of course, to Rex Morgan for his gracious permission to reprint them here on Shroud.com. We are pleased to announce that our Shroud Speakers Directory page has been updated with a new listing for Shroud scholar Cheryl H. White, Ph.D.	, who is now available to speak to your group or organization. Cheryl is an academic historian of medieval and early modern Europe, and holds the rank of Associate Professor in the Louisiana State University system, where she has taught for over twenty years. 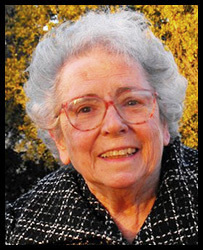 She has published in the field of sixteenth century studies, church history, and has a long-standing interest in the Shroud of Turin as both a historical artifact of great interest to secular scholars but also as a holy relic of Christianity. She brings her expertise as a lecturer to systematically explore the consensus of current scholarship on the Shroud for broad-based audiences. Welcome to our directory Cheryl! This will be our last website update before this conference takes place at the TRAC Center in Pasco, Washington State, USA on July 19-22, 2017. Click on the above photograph to visit the newly updated conference website where you can find more details, register for the event, learn about travel, hotels and accommodations, view a video from the conference organizers and much more. Conference organizer Robert Rucker was kind enough to provide us with a copy of the CONFERENCE PROGRAM (as of May 21, 2017) which we are making available to you here. 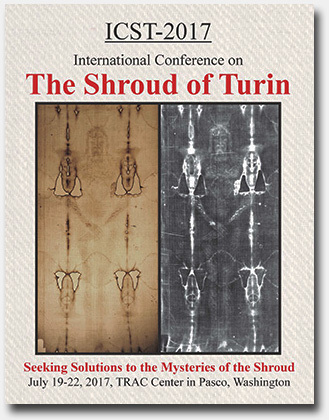 Note that the conference organizers have decided to permanently archive the papers here on Shroud.com, so we will be creating a dedicated page for the event (as we did with the 2014 St. Louis Conference), which will become available in a future website update. Unfortunately, I will not be able to attend the conference myself, so STERA, Inc. Board Member Russ Breault, who is making several presentations at the event, will cover it for Shroud.com. We look forward to including his article and photographs in our next website update. I am addressing you under the authority of the President of the Polish Theological Society, Father Professor Kazimierz Panus. I am the new Deputy Head of the Syndonology Section of the above-mentioned Society. We have been greatly impressed by the personality of Mr. Schwortz as well as the Shroud of Turin website, undoubtedly the most comprehensive and up-to-date website taking up the subject of the Shroud of Turin and its research. Therefore, our Section would be happy to establish permanent contacts between us, in order to be able to exchange information, views, as well as reports on the current studies on the Shroud. Should that proposal be of any interest to you, we will looking forward to your reply. Thank you so much for writing and I am very happy to learn about the Polish Theological Society! Please send my warmest regards to Father Panus as well. I am very pleased to establish a permanent relationship with your Society and help promote and further the work you are doing in Poland via our website. I know that we have many website visitors from Poland. You may not be aware of it, but I have special place in my heart for Poland, as both my mother and father were born there! In fact, in 2011, I lectured extensively across Poland (in Warsaw, Poznan, Lodz, Czestochowa and Krakow) and returned in 2012 to speak in Gdansk, Warsaw and Wisznice (the village where my mother was born). You can read the article I wrote about it at this link: Lectures in Spain, Italy and Poland - April 2011 (starting on page 7). We typically publish major updates to our website around four times each year, with smaller updates in between if important Shroud news breaks. Our next major update goes online this coming Saturday, 21 January 2017 and marks our 21st anniversary on the internet. Consequently, I am in the final stages of the update and it is too late for me to add anything to it at this point in time. However, we should plan to do an introductory feature on your organization for our Spring update, probably sometime in May. And we are happy to publish the information in both English and Polish, since I am sure you can provide both. I thank you again for taking the time to contact me and look forward to a long and fruitful relationship between the Polish Theological Society and STERA, Inc.
On Easter Sunday the History Channel aired a new program titled, "The Jesus Strand: A Search for DNA," although a better title might have been, "The 'Broken' Strand." The program's promotional materials implied that new testing was done on the Shroud of Turin to extract possible DNA from the cloth. In fact, here is a direct quote: "In Turin, Italy, they were allowed to do tests on the Shroud of Turin, recorded in the Bible as the burial shroud that wrapped Jesus. 'The Vatican has only allowed two tests of it,' Basile said. 'They allowed us access to their testing, and we did some tests ourselves.'" Yet the program itself was very obscure about the source of their data or where the samples came from. That prompted me to write directly to the Turin authorities to ask if any such new testing had been permitted. Their reply was immediate and explicit: "No permission for a direct test has been given to anybody by the Vatican and there is no knowledge of any blood test made on "official" samples." So what samples were used in the making of the program? After watching it a second time and paying close attention, I realized that the samples used were from the dusts aspirated (vacuumed) from between the Shroud and the Holland Cloth by Prof. Giovanni Riggi in 1978. The problem with those dust samples is that no provenance can be determined for whatever particles might be found in them. There is no way to be certain what was found came from the Shroud or the Holland cloth or somewhere else. In fact, the Turin authorities declared years ago that they would not recognize any scientific research or accept any scientific conclusions based solely on those samples for that very same reason. Consequently, any claims made in this program are not truly supported by any credible scientific evidence. We have no idea if the DNA they tested was from actual Shroud blood or from any of the thousands of people who have handled it over the centuries (including me). For more than ten years we have made available beautiful Shroud transparencies in backlit PhotoGlow® Frames. One of the main reasons for their popularity is that backlit images have a 400% greater dynamic range vs. a normal photographic print viewed with reflected light and consequently, allow the viewer to see dramatically more depth and detail in the image. We started by offering just a Small Shroud Face but soon added a larger Lifesize Face and a separate Shroud Ventral image. Over the years, many people also requested that we offer a Dorsal view to match the Ventral one. We have listened to our viewers and are very happy to announce that a NEW DORSAL VIEW IS NOW AVAILABLE on the Website Store page that is designed to match the Ventral in both size and image quality. However, since the backlight technology has evolved over the years (from fluorescent bulbs to LED's) and the transparencies are now made digitally rather than photographically, it is possible that the density and color of the new Dorsal view may not perfectly match the density and color of the earlier Ventral versions. If you find that is the case, you can simply adjust the individual backlight brightness controls to obtain a matching result. Please understand that because of these variables, we cannot guarantee a perfect match. Also, we are still offering a major discount on the Small Shroud Face while supplies last. See the Website Store page for details and larger photos. "Is the Shroud indeed the burial cloth of Jesus, or is it a medieval fake? Do the Gospels narrate real events or are they mere legends? The answer to these questions is not secondary since it involves deeply our lives. Certainly, the Shroud is the most studied archaeological find in the world, and the Gospels constitute the only key to its interpretation. 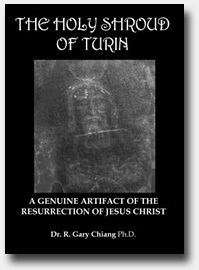 This link between Shroud and Gospels, therefore, suggested to the Authors to combine the latest scientific research on the Shroud to an investigation equally scientific and documented on the reliability of the Gospels..."
We are listing the book here but have also permanently archived it on the Shroud of Turin Booklist page (alphabetically by author). To make it easy to find the new additions, we have annotated each new listing with "(Added 8 June 2017)" so simply search for that phrase on the Booklist page. We usually begin this section with the most recent paper published and work our way down the list from there. However, in this update we are doing just the opposite and starting with a rare, previously unpublished 1995 article by STURP imaging expert Donald J. Lynn of the Jet Propulsion Laboratory (thanks to our dear friend Paul Maloney). Don had written the article specifically to be included in a multi-volume Shroud reference book Paul was writing and compiling but which, for a variety of reasons, has never yet been published. Fortunately, the topic of image processing recently came up on the online Shroud Science Group and prompted Paul to find a printout of the article. He scanned it and sent it to us and we converted it to a text readable pdf file and are proudly publishing it here for the first time. We have also added three additional important legacy papers, the first by Dr. August Accetta that was originally presented at the 3rd International Dallas Conference on the Shroud of Turin in 2005 and which deals specifically with radiation and the head image of the Shroud. The second is a 2012 paper by Dr. Niels Svennson and Dr. Thibault Heimburger and deals with the bloodstains on the Shroud. The third is a 2012 article by Kelly Kearse from Dan Porter's Shroud of Turin Blog that discusses cloning and the Shroud. Also included, as always, are links to many other papers and articles that were published more recently. All have also been permanently archived on the Scientific Papers & Articles page (alphabetically by title) and the Website Library page (alphabetically by author). The Lenten season always results in many lecturers around the world making presentations about the Shroud and this year was no exception. Of course, with the advent of the internet these now become readily available for everyone to view. Included here is a selection of many, recently released video and audio presentations on the Shroud of Turin. I hope we didn't miss any important ones. The Shroud of Turin – Double Awakening by Waldemar Kurek-Mosakowski - (Polish Language with English subtitles) - 33:56 - (Please turn on the subtitles in the right bottom corner of the movie screen). - Published May 19, 2017 - The film shows - recently discovered - real pictures (not computer visualization) of the face of the Risen Jesus Christ. The movie was based on the author's personal experience with the Shroud of Turin and other relics "not human hand made." The Shroud of Turin presented by Reese Norris, Esq. - 1:08:17 - Presented April 10, 2017 at Citrus Springs Community Center, Citrus Springs, Florida. Also included is a link to his PowerPoint Presentation. For those of you who may not know the name, Reese was the original STURP team's legal counsel. Shroud of Turin Authenticity Confirmed - Lynn Leahz radio interview with Barrie Schwortz - 33:07 - Original air date February 9, 2017, Published February 10, 2017. Audio program with added video. Lynn hosts a popular, dramatic, prophecy-based radio program and website and told me she originally was skeptical about the Shroud of Turin. The Shroud of Turin by Thomas de Wesselow - 20:51 - Published on February 6, 2017. 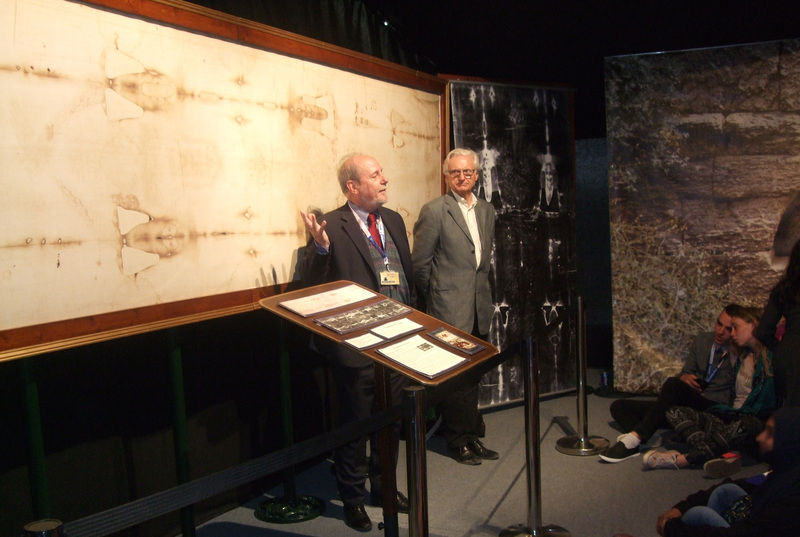 Art historian Thomas de Wesselow discusses his work on the Shroud of Turin. 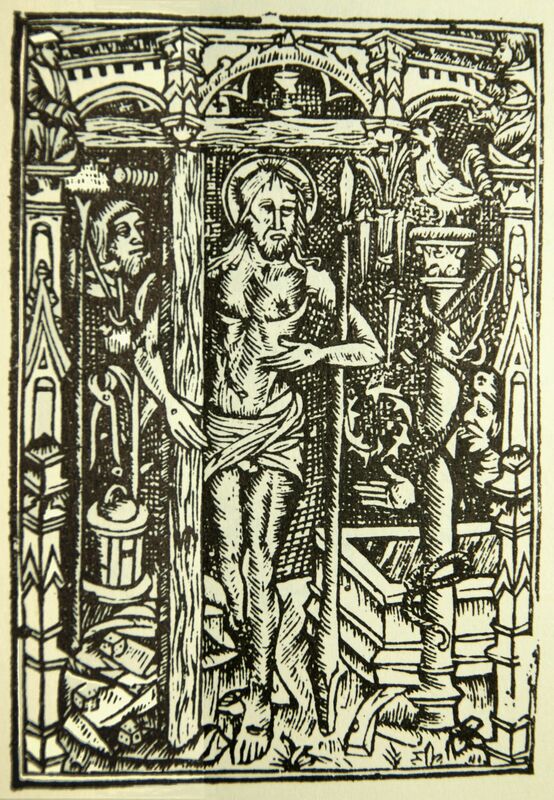 Though carbon-dating seems to place the shroud in the 14th century, de Wesselow has evidence of its authenticity and believes that it provides the answer to the crucial question of what exactly made early Christians believe in the Resurrection. The Case for Jesus: Science and the Shroud of Turin by Fr. Robert Spitzer, S.J. - 52:20 - Published on February 4, 2017 - From the Catholics @ Work OC November 2016 Prayer Breakfast: Fr. Robert Spitzer, S.J., founder of the Magis Center of Reason and Faith (magiscenter.com), discusses the history of the Shroud of Turin and the scientific evidence for its authenticity. 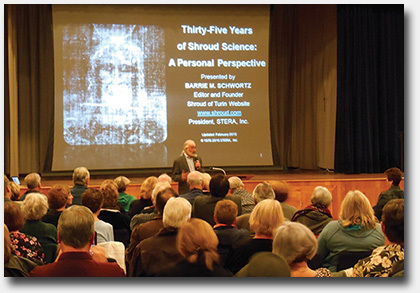 Shroud of Turin Presentation March 2014 with Dr. Wayne Phillips - 1:00:54 - Published on April 16, 2014 - From a presentation made at St. Lawrence Catholic Church on March 26, 2014. Wayne continues to update and make his beautifully produced Shroud presentations available around the country. 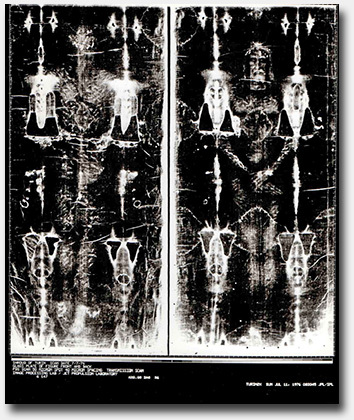 Further testing needed for the Shroud of Turin by C. S. Morrissey discusses the research of Shroud scholars Mark Antonacci and Dr. Phillip Wiebe and the need for additional scientific testing of the Shroud. From the B. C. Catholic website, June 2, 2017. Jerusalem Quake Seasonality - Latest news from Jeff Williams and his Dead Sea Quake website ("Geologic Research into Events reported on the Day of the Crucifixion"), and his just completed crowd-funding campaign to radiocarbon date certain geologic samples. May 2017. Controversial researcher loses 12th paper that’s “literally copied;” authors object by Victoria Stern - A physics journal has retracted a 2011 paper by a group of scientists based in Italy, noting it’s “literally copied” from a paper by the same authors. From the Retractionwatch.com website, May 15, 2017. 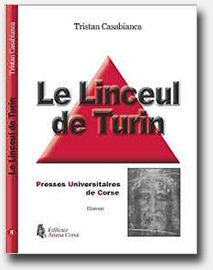 Monnaies du linceul de Turin : les questions qui subsistent (Currencies of the Shroud of Turin: the remaining questions) French language article by Lebanese Shroud scholar Farès Melki that challenges the recent conclusions by Italian numismatist Agostino Sferrazza who claims he has identified coins that cover the eyes of the Man of the Shroud. From the Aleteia website, May 6, 2017. New Evidence Shroud Dates To 1st Century is an article that describes the recent study by Italian numismatist Agostino Sferrazza claiming he has identified coins that cover the eyes of the Man of the Shroud. From the Worldnet Daily website, April 30, 2017. 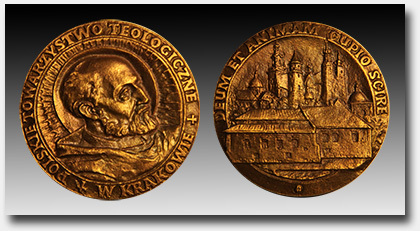 Shroud of Turin coins may finally have been identified is an article by Daniel Esparza that describes the recent study by Italian numismatist Agostino Sferrazza claiming he has identified coins that cover the eyes of the Man of the Shroud. From the Aleteia website, April 26, 2017. Still Shrouded in Mystery by K. V. Turley is an article that details the contributions of award winning film maker and Shroud scholar, David Rolfe and the impact his work has had on the author. From Crisis Magazine, April 20, 2017. Easter and the Shroud of Turin: ‘Nothing Is Impossible with God’ by Myra Adams provides a good general overview of the Shroud and ends on a spiritual note. From the National Review website, April 15, 2017. [Editor's Note: Myra tells me her article was heavily edited before publication]. Shroud of Turin at St Patrick’s Cathedral - story and photographs of one of our Lifesize Shroud Replicas on display in the Sacred Heart Chapel of St. Patricks Cathedral in the Archdiocese of Parramatta, NSW, Australia, from the Catholic Outlook website, April 13, 2017. 'Man of the Shroud' exhibit by John Curry, West Carleton Review, covers the public exhibition of the Vancouver Shroud Association's traveling Shroud exhibit at St. Isidore Church near Ottawa, Canada. Originally published April 10, 2017 on the Ottawa Community News website. The Glorious Quest for the Sweet Wood and Sweet Nails by John M. Grondelski is a book review of a reprint of British writer J. Charles Wall’s 1910 book, Relics of the Passion - Where They Went and How They Got There, now available to a new century of readers. Apparently, one of the relics discussed in the book is the Shroud of Turin. The article appeared on the National Catholic Register website on April 9, 2017. Could the Shroud of Turin be Jesus’ actual burial cloth? by Richard Ostling from his Religion Q & A blog published on the Patheos website on April 3, 2017. Has Science Proven the Shroud of Turin to Be a Medieval Forgery? by Ryan Fitzgerald is an article that appeared on the ChurchMilitant.com website on March 27, 2016. The article is sub-titled, "Despite what skeptics insist, its authenticity remains scientifically tenable." Tavola della Sindone con reticolo (Shroud Table With Reticle) (In Italian), is a pdf format article that includes several high quality Shroud images with a grid overlay that could prove useful for Shroud researchers. Our thanks to Paolo di Lazzaro for letting us know about it. 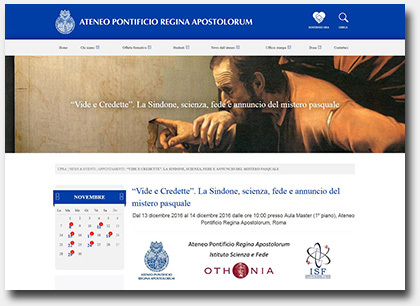 From the Centro Internazionale di Sindonologia website in Turin, available since 2003. I don't have an exact date for the next update, but I do know it will occur in the Fall, probably sometime in September. I do know for sure that the next update will include a Special Feature on the Shroud and the Eastern Orthodox Church, reports on the 2017 Shroud Conference in Washington State and the Jalsa Salana Convention in England, more issues of Rex Morgan's Shroud News, the latest papers, books, articles and videos and of course, any breaking Shroud news. To be sure you don't miss any important Shroud information as it occurs, check our STERA, Inc. Facebook page from time to time, since we now try and update it every week or so to keep you informed between our regular quarterly website updates. You can also join our Website Mailing List and receive an e-mail whenever the site is updated or any important Shroud news breaks. We hope you find this update interesting and useful and look forward to seeing you in the Fall! Thank you all again for being there and have a great summer! Today, January 21, 2017, marks our 21st anniversary on the internet! Another year has passed and the website continues to grow and thrive, thanks to you, our loyal visitors and friends! Our anniversary updates are usually large ones and often international in scope and today's update is no exception. In fact, the first five articles represent material from the U.S., Australia, Italy, England and Finland! 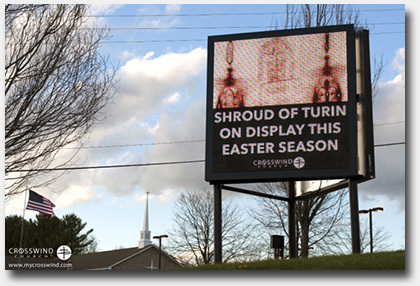 We start with news of an innovative Shroud billboard project here in the U.S. that has its roots in a similar recent project in Dublin, Ireland. This update also brings you five more issues of Rex Morgan's Shroud News, video links to the entire December 2016 Rome Shroud Conference, the latest issue of the BSTS Newsletter, Shroud news from Finland, along with links to many new books, articles, papers, videos and much more. Let's get started! 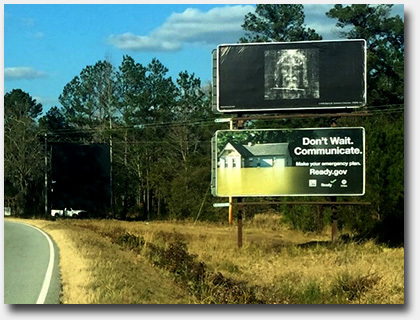 Last year I was contacted by Val Kelly of Hilton Head, South Carolina, who told me about a project where an organization in Dublin, Ireland published billboards of the Shroud face without any accompanying text or verbiage and created quite a strong public reaction. Val wanted to duplicate the idea near her home in Hilton Head with the help of her prayer group and asked me what it would take to obtain an image for that purpose. I liked the idea of a Shroud image without any text since each person who saw it would have to think about it and ultimately make up their own minds about what it meant. I agreed to provide the image and Val and her prayer group funded the production of a test billboard that will remain in place for one year. You can see the result in the accompanying photographs. 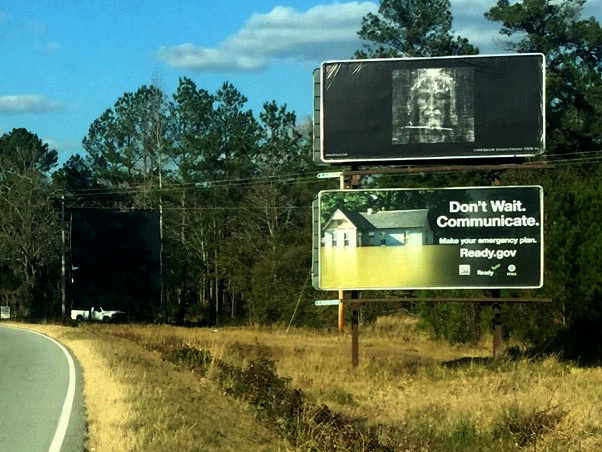 The billboard, which receives over 19,000 impressions per week, is viewable on the way back from Savannah toward Bluffton/Hilton Head, approximately six miles south of the Route 46 traffic circle (one mile south of the Pink Pig Restaurant) on Rt. 315, with Bellinger Hill Road being the closest intersection. (Click here for map provided by the billboard company). According to Val, "We plan on making presentations to the local Catholic churches to see if they would have interest in sponsoring additional, local billboards and then hopefully expand from there. I do have contacts in South Carolina and will investigate expanding further. It will take some time, but, will keep you in the loop on our progress." "The image of The Holy Face that we saw in the photograph was on Sarsfield Road in Inchicore, in outer Dublin. 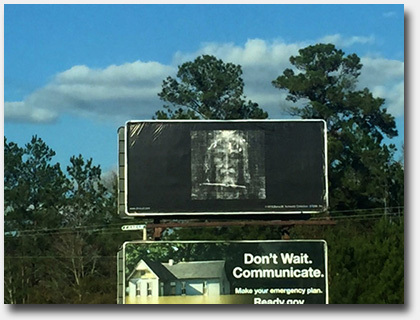 This billboard is one of many that is part of The Holy Face Project. Twenty eight are scattered throughout Ireland with 8 in Dublin. This project is a small part of the greater Human Life International, a Pro-Life Organization. Mr. Patrick McCrystal is the project manager. He organized a national prayer service in all 32 counties in Ireland that featured a large Holy Face banner at each service. 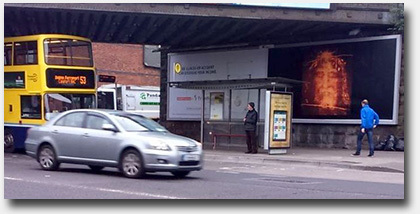 There was also a project that brought the Holy Face inside the bus system in Dublin. They estimate that more than 1,000,000 viewed the image within the 200 buses. McCrystal raised necessary funding through an appeal to the Human Life International membership. They raised more than €60,000. Pam Moon also had a traveling Shroud exhibit that traveled from Dublin, to Cork, to Knock during 2014. Ireland has it "going on!" - Richard"
UPDATE: I am very pleased to report that as soon as this update went online we received a cordial greeting from Patrick McCrystal, the man who manages the Ireland Holy Face Project that inspired the South Carolina group. We have agreed to stay in touch and Patrick was kind enough to send me a copy of their newsletter, which includes many more details and photographs. You can read it here: The Holy Face Project Newsletter. He also provided us with a link to their new website, www.theholyface.com. We will keep you posted on everyone's progress. With this update we add five more issues to Rex Morgan's Shroud News archive, which will total 118 issues when complete. This update includes Issue #62, December 1990 through Issue #66, August 1991 with articles by such notable Shroud scholars as John Tyrer, Ian Wilson, Eoin Ó Máille, Andre Van Cauwenberghe, Remi Van Haelst, Joe Nickell, Prof. Daniel Scavone, Prof. Alan Whanger and Mary Whanger and Father Peter M. Rinaldi, S.D.B. Our sincerest thanks as always to Stephen Jones for his extraordinary effort in scanning and optical character recognition of every page, Ian Wilson for providing the original issues and valuable input and of course, to Rex Morgan for his gracious permission to reprint them here on Shroud.com. As we announced in our last update, an International and Interdisciplinary Conference on the Shroud of Turin with the theme, "He saw and He believed". The Shroud, science, faith and proclamation of the Paschal Mystery, was held in Rome on December 13 - 14, 2016. 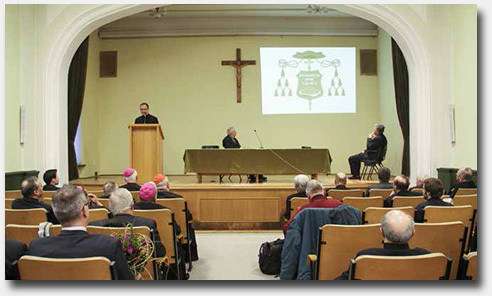 The event was sponsored by the Institute of Science and Faith of the Pontifical Athenaeum Regina Apostolorum, in collaboration with the International Centre of Sindonology in Turin. Speakers included Prof. Antonio Cassanelli, Prof. Gian Maria Zaccone, Mgr. Giuseppe Ghiberti, Father Andrew Dalton LC, Father Nicolas Bossu LC, Father Rafael Pascual LC, Dr. Petrus Soons, Dr. Ada Grossi, Fr. Gianfranco Berbenni OFM Cap, Prof. Bruno Barberis, Prof. Paolo Di Lazzaro, Roberto Falcinelli and many others. VIDE E CREDETTE 14-12-2016: https://www.youtube.com/watch?v=qFjj2cBU9Qg (Schwortz presentation in English begins at 1:26:30. Petrus Soons presentation in English begins at 2:49:00). The Contributions of the Shroud of Turin Research Project - 640x480 mp4 Video Presentation - 11:03 (84 MB) (This will take a few minutes to download). 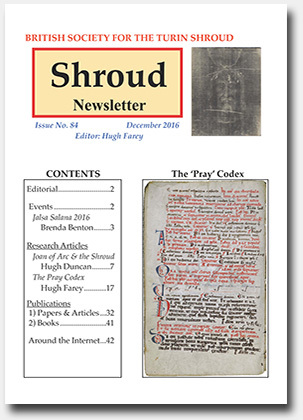 We are happy to report that the British Society for the Turin Shroud page of the website has been updated and the latest December 2016 Issue No. 84 of the BSTS Newsletter is now online. This issue includes several in-depth research articles starting with Did Joan of Arc See the Turin Shroud? by Hugh Duncan and The Pray Codex by Hugh Farey, the newsletter's Editor. It also includes a reprint of Pollen on the Shroud of Turin: The Probable Trace Left by Anointing and Embalming by Marzia Boi and an event article by Brenda Benton titled My First Visit to Jalsa Salana. Also includes news from around the internet and much more. The Exhibit: Date: March 27 - April 17, 2017. Place: Turku, Finland. Martinkirkko (Church of Martin). The first exhibit in Finland (2010) was also arranged here. Exhibit program is included as a part of the Reformation 500-year celebrations in Turku, as it was the former capital of Finland and the place where Mikael Agricola, in the inspiration of Martin Luther, worked and translated the Bible into Finnish and therefore started the Reformation here too. Juha also pointed out that although the topics of the scheduled lectures are not directly related to the Shroud of Turin, some references to it will undoubtedly be made. You will also find his latest book, a revised and updated edition of his 2009 Finnish language work, will soon be available and is listed in our Recently Published Books section below. It is great to see an ongoing effort to educate the people of Finland about the Shroud of Turin by Juha and his colleagues. Thank you for keeping us informed Juha! 2017 Lecture Tour on the Shroud - With the conference on the Shroud of Turin (www.shroudconference2017.com) coming up July 19 to 22 in Pasco, Washington, Bob Rucker and Mark Antonacci are planning a lecture tour (mid-March to mid-April) to reach people at research facilities and population centers across 14 states. 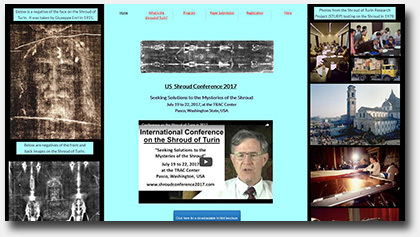 An outline of this lecture tour is available at http://www.shroudconference2017.com/lecture-tour.html and at http://testtheshroudonline.com/shroud-2017-conference/. 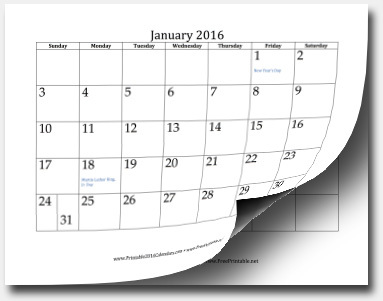 As specific locations, dates, and times are arranged, they will be made available on these sites. Those interested in helping in this effort should contact Bob (H: 509-375-4770, C: 509-628-6894) or Mark (314-704-0537). Several new Shroud related books have been published in recent months. We are listing them here but have also permanently archived them all on the Shroud of Turin Booklist page (alphabetically by author). To make it easy to find the new additions, we have annotated each new listing with "(Added 21 January 2017)" so simply search for that phrase on the Booklist page. Since we included a Shroud News from Finland feature in this update, we wanted to include the latest Finnish language book on the Shroud, even though it is not yet available online. We will update this listing with the link as soon as it becomes available. 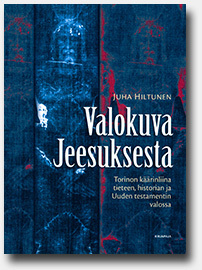 In the meantime, you can order the book directly from the publisher by sending an e-mail to tilaukset@kirjapaja.fi. According to the author, this book is a "completely revised edition in March 2017 (of his 2009 1st edition). It contains all the relevant new research data since 2009 and more visual material compared with the first edition. And the question mark is now removed from the title, because all this new data (incl. dating of the Shroud to the 1st C) confirms more precisely, I think, that it is truly a photograph of Jesus." "In 2015, over one million people came to pray, or to simply pass an ancient linen cloth: the Shroud of Turin. The reason for its attraction is simple: it is deemed to have wrapped the body of Jesus of Nazareth after his crucifixion in Jerusalem... The reputation of the Turin shroud is old: it was at least in existence during the second half of the fourteenth century, at Lirey in Champagne... 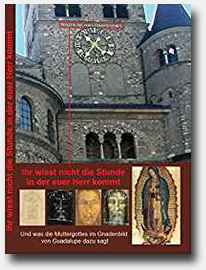 This book presents a rigorously consolidated statement and update of our knowledge on the shroud of Turin. It then assesses methodically different image forming hypotheses. Tristan Casabianca was born in Bastia in 1982. A graduate in history of public law and political ideas as well as economic analysis of law (Universities of Aix-Marseille, Hamburg, Rotterdam), Tristan Casabianca is particularly interested in its academic publications (the Heythrop Journal, New Blackfriars) scientific and philosophical consensus on the shroud. Relying on traditional historiographical criteria, he has proposed, in 2013, a new method for assessing the Shroud of Turin." Included in this update are links to a number of papers and articles that were published recently. All have also been permanently archived on the Scientific Papers & Articles page (alphabetically by title) and the Website Library page (alphabetically by author). [Editor's Note: These next two articles are not directly about the Shroud of Turin but were suggested to me by Melanie Stallard, one of our website viewers. This is what she wrote regarding the first article]: "I just wanted to mention to you an article I read in the September issue of Science magazine about a new technology to read extremely damaged artifacts, called, "virtual unwrapping." I include the original article and citation below, but it occurred to me as I read the article to wonder if any application of virtual unwrapping could glean further information from the Shroud." Since the technology mentioned in the article is far beyond my expertise, I thought I would include the article here to see if it can stimulate any interest or response from Shroud scholars. 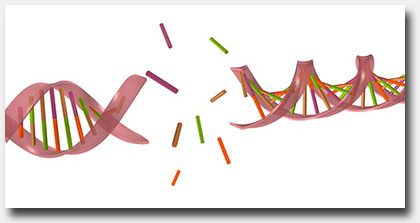 The first article is titled: From damage to discovery via virtual unwrapping: Reading the scroll from En-Gedi by William Brent Seales, Clifford Seth Parker, Michael Segal, Emanuel Tov, Pnina Shor and Yosef Porath, Science Advances, 21 September 2016, Vol. 2, no. 9, e1601247. A few weeks later Melanie sent me a follow up e-mail that said: "I have happened across another article that describes a technology perhaps you already know about, terahertz imaging, which was used at MIT Media Lab to attempt to read multiple pages of an unopened book. They used: (1) a terahertz camera that emits very high radiation, (2) an algorithm to detect the reflection of the radiation bursts caused by each page and (3) computational imaging to detect the images of the letters on each page. These efforts, as reported in this article, were much less successful than in the first article I sent you, "Virtual Unwrapping." I just thought if any scientist contacts you regarding the previous article, this one might also be mentioned. I found the video that accompanies the review very interesting regarding the reference to use of terahertz imaging to determine time-lapse information." Here is the link: Judging a book through its cover - New computational imaging method identifies letters printed on first nine pages of a stack of paper by Larry Hardesty, MIT News Office, September 9, 2016. [Editor's Note: It is highly unlikely that any technology that "emits very high radiation" could be considered "non-destructive" or would ever be appropriate for use on the Shroud]. A number of new Shroud related videos have been released recently and we are including links to them here. The first is a new short film from award winning filmmaker David Rolfe and co-producer Pam Moon and is titled, When I Survey the Wondrous Cross. 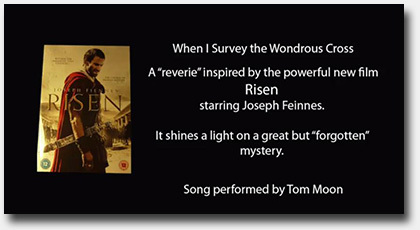 The video, inspired by the feature film "Risen," is beautifully produced and edited with an equally beautiful soundtrack performed by Tom Moon. This is a truly inspirational music video from the producer of the award winning 1978 film, "The Silent Witness," the first ever documentary on the Shroud of Turin. David has graciously posted the 4 minute 20 second video on Vimeo at the above link to share it with all of us. He has also made available a new Vimeo link to his superb 2016 film, A Grave Injustice (which we featured in a Special Update on March 19, 2016, in case you missed it). The Shroud of Turin as the Burial Cloth of Jesus: Answers for Critics, is the title of a one hour twenty-three minute presentation made by Dr. John Johnson at an Apologetics Symposium held on October 16, 2016 at the Cedar Park Church, in Bothell, Washington. This is a YouTube video of his complete presentation. Dr. Johnson has a PhD in Applied Math from the University of California at Berkeley. He retired from Boeing after 31 years, mostly in Aerospace. He has studied and taught Bible archaeology since he was a Biblical Christian in 1980. Russ Breault: Could the Shroud be a Receipt? is the title of a 22 minute video of one of Russ' excellent Shroud Encounter presentations, which he just posted on YouTube. Here is what Russ wrote us in a recent e-mail: "Some of you who have seen my Shroud Encounter presentation know that I end with the idea of the Shroud as a receipt, a proof of purchase. Could it be a record of the transaction between God and man? Could the Shroud be an itemized receipt documenting the price that was paid?" Mark Antonacci: Test the Shroud - At the Atomic and Molecular Levels is the title of a recent audio only podcast interview with Mark on The Mind Renewed.com. Here is an excerpt from the description on their website: "Arguing that new scientific tests might contest these findings and reveal the Shroud to be very probably the genuine burial cloth of Jesus Christ, Mark Antonacci proposes a scientifically-testable hypothesis that particle radiation emanating from the shroud-wrapped, crucified body may account for very many of the Shroud's features, such as full-length body images, still-red blood marks, erroneous carbon dating and more." Our good friend Jim Bertrand reports that the website for the recently formed American Confraternity of the Holy Shroud is now online. Produced by Robert Siefker, the new website went online on December 28, 2016. According to the site, "The possibility of strengthening faith, and potentially changing lives, is what prompted the founding of the American Confraternity of the Holy Shroud (ACHS). The mission of the Confraternity is to develop ways that the Shroud, whether it is “authentic” or an iconic representation of Jesus’ passion and death, may illuminate and strengthen Christian faith." The Mysteries of the Shroud of Turin by Robin Barret is an article that appeared on December 16, 2016 in Newsminer.com, "The Voice of Interior Alaska." 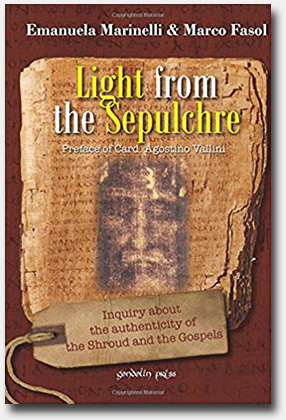 Here is an excerpt: "Some have called the Shroud of Turin an elaborate hoax; others have called it a miraculous artifact of the passion, death and resurrection of Jesus. It is either one or the other. What is the shroud and where does it come from?" 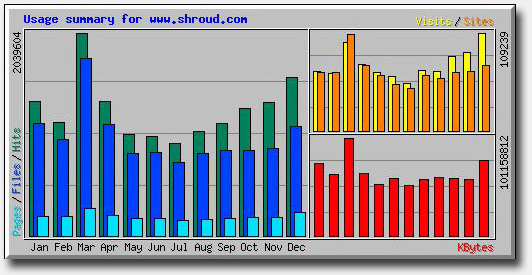 2016 was another great year for Shroud.com web traffic, although we did not surpass our 2015 record of 1 million+ visitors. Of course, that year the Shroud was on public display and garnered considerable media attention which drove lots of extra traffic to our site. Our final total for 2016 was 895,995 visits and we averaged more than 2450 visitors per day or around 75,000 visitors per month. In 2016 our visitors generated over 15 million hits, viewed nearly 12 million files, viewed over 2.3 million pages and generated 704 GB of bandwidth! You can see the details for yourself by clicking on the above graphic. We thank you, our loyal viewers, for your continued participation and support! Since viewers often write me asking where and when I might be giving Shroud presentations, I am again including my upcoming schedule in case I happen to be in your area. If so, please drop by and say hello. Also, please understand that as of this writing, the schedule is by no means complete and that many of the times and venues are still not finalized and subject to change. I will do my best to update them prior to the events. March 8 - 9, 2017 - I will again be speaking at the University Series™, an annual multi-parish adult education program held in Southern California each year during the Lenten season. The University Series™, an event created and organized by my dear friend Fr. Dave Heney, offers 90+ seminars connecting faith with real life in areas such as current events, contemporary moral issues, evangelization, faith and science, marriage and family, church history, scripture and prayer. The 2017 season runs from March 2 to April 7 at twelve different parishes in Los Angeles and Ventura counties. I will make three presentations, the first on Wednesday, March 8th at 7:30-9:00 pm at the St. Mel Activity Center, the second on Thursday, March 9th at 7:30-9:00 pm at St. Mary's Church in Whittier and the third, a special lecture (not part of the University Series) at 9:30 am on March 9th at Our Lady of Malibu church. If you wish to learn more you can visit the University Series Website where you can review each topic and sign up for the sessions. The charge to attend is $8 per person, but you can bring a friend for free! March 24 through March 26, 2017 - I will be lecturing at Immaculate Conception Church, 2310 Robertson Ave., Norwood, Ohio (near Cincinnati). The event is the premiere of a new Shroud Speaker Series organized by the Shroud Project of Cincinnati. On Friday, March 24, 2017, I will make two presentations to students, parents and teachers at the parish school, Immaculate Conception Academy. I will give one public lecture on Saturday, March 25, 2017 (starting at 10:00 am) and one public lecture on Sunday, March 26, 2017 (starting at 11:00 am). You can register for any of the public lectures and see their complete 2017 speaker schedule on the special Signup.com website: Shroud Speaker Series Registration. I hope to see some of you there! April 4 through April 7, 2017 - I will once again be lecturing along with the Vancouver Shroud Association's "Man of the Shroud Exhibit" at St. Isidore Roman Catholic Church in Kanata, near Ottawa, Canada. The complete lecture and exhibit schedule and other details are also now available on St. Isidore's Man of the Shroud Exhibit website. I will be giving ten lectures over the four day schedule. May 2 through May 5, 2017 - I will again be teaching my Shroud of Turin course in the Masters of Science and Faith program at the Ateneo Pontificio Regina Apostolorum in Rome. July 28 through 30, 2017 - I will once again be in England and speaking at the 51st Annual Jalsa Salana Ahmadiyya Muslim Community Convention in Hampshire. Watch for an in-depth article about the event in our Fall Update in October. September 29 through October 1, 2017 - My dear friend Dr. Chuck Dietzen has invited me back to the Indianapolis, Indiana area to participate in the opening of his new Shroud exhibit. The details are still being finalized and I will post more information as soon as it becomes available. October 12 through 15, 2017 - My dear friend and brother Pete Schumacher has invited me back to lecture at his Shroud Exhibit and Museum (SEAM) in Alamogordo, New Mexico. I will give one lecture on Thursday, October 12, 2017 at 6:30 pm at the Flickinger Theatre, 1110 New York Ave., Alamogordo, New Mexico and another on Saturday, October 14, 2017 at 6:30 pm at the Silver City Convention Center in Silver City, New Mexico. December 1 - 2, 2017 - I have been invited to speak at a conference named "The Real Presence: Eucharistic Miracles; the Holy Shroud; and Our Lady of Guadalupe," in New Braunfels, Texas, hosted by the Fullness of Truth Catholic Evangelization Ministries in Texas. The event is being held at Sts. Peter and Paul Catholic Church, 386 N. Castell Ave., New Braunfels, Texas 78130. I don't have an exact date for the next update, but I do know it will occur in the Spring, probably sometime in May. A lot will depend on my travel and lecture schedule, which is not yet finalized for this year. Although I don't know the exact date, I do know for sure that the next update will include more issues of Rex Morgan's Shroud News, the latest papers, books, articles and videos and of course, any breaking Shroud news. To be sure you don't miss any important Shroud information as it occurs, check our STERA, Inc. Facebook page from time to time, since we now try and update it every week or so to keep you informed between our regular quarterly website updates. You can also join our Website Mailing List and receive an e-mail whenever the site is updated or any important Shroud news breaks. We hope you find this update interesting and useful and look forward to seeing you in the Spring! Thank you all again for being there! It is deeply appreciated.